After you scoop out and carve your pumpkin, dip it in a large container of bleach and water (use 1 tsp bleach:1 gal water). Let sit submerged for 10-15 min. 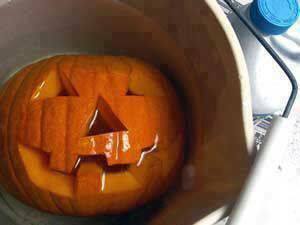 The bleach will kill bacteria and help your pumpkin stay fresh longer. Once completely dry, (drain upside down), add 2 tablespoon of vinegar and 1 teaspoon of lemon juice to a quart of water. Brush this solution onto your pumpkin to keep it looking fresh for weeks.